Don’t look so discouraged..! Not all is lost!! ‘Au contraire…’ you’re in a very unique position of blending your Tarot experience with your new Lenormand knowledge!! I’ve been reading the Tarot for almost 20 years now, and I’ve been practicing with the Lenormand oracle for roughly half that time. But in that time, I have used various techniques that have successfully incorporated both systems! What follows is my advice to all of you Tarotmancers out there that do decide to throw yourselves into the deep end by blending the Tarot and the Petit Lenormand systems together! The Tarot is from Mars! First of all, the Tarot system assigns a particular meaning to the card’s place in a spread. 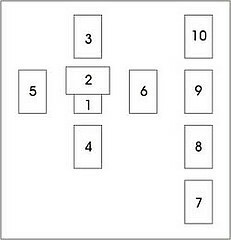 For example, in a Celtic Cross spread, if a card lands in a certain spot, it represents what people think of you. In another, it represents what you hope or fear, etc, etc. What you are in fact doing in Tarot is telling the cards ‘if you land in position #9, you’re talking about my hopes and fears, if you land in position #5, you’re talking about the recent past.’ The tarot cards will stand by themselves to give you some insights into your situation. You also have 78 cards to help you, so you have a wide range of interpretations since each Tarot card has its unique twist. You can make heavy use of symbolism on the card’s picture, its suit, and you can glean an extra layer of karmic principles with the Major Arcana. As you know, there is plenty of food for thought with the Tarot! Lenormand just doesn’t work that way, though! The Petit Lenormand deck has 36 cards; less than half the cards you’d find in a Tarot deck! Not only that, Lenormand isn’t even a complete deck of cards! Where the Tarot’s Minor Arcana could be considered a modified deck of playing cards (from deuces to aces), Lenormand is based on an abridged deck of playing cards (sixes to aces). Obviously, there is a lot less that a single card can possibly tell you!! Which is why the Lenormand method bases itself more on what a combination of cards might mean together, rather than what a single card by itself would tell you. 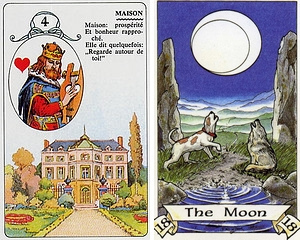 So, while using the Tarot would resemble shooting a billiard ball directly into a corner pocket, Lenormand would be more like rebounding the ball from the buffer and into the pocket. In this case, the buffer is another card that helps you add more meaning to your interpretation (actually, the more Lenormand cards that you bounce off each other, the better in my opinion). Still with me? If not, the important thing to remember is that Lenormand needs you to pair up cards in order to give you a wider range of interpretations. What most Tarotmancers are tempted to do is use something familiar like the Celtic Cross and use it to work with Lenormand, but as we’ve just discussed, a Lenormand card needs to be paired up with another card. What Tarotmancers are in fact doing by using the Lenormand cards in a Celtic Cross spread, is taking them away from their natural dynamic and potential… Using specific layouts with specific meanings aren’t the best way to use Lenormand. What you must use is a method that lets you make as many associations as you possibly can… something that most Tarot spreads don’t do. – Basic Guidelines for Reading with the Petit Lenormand Oracle covers String Readings which work really well combined with the Tarot. THAT SAID… combining Lenormand with Tarot is a powerful technique! No joke, I am particularly fond of blending them together for Petit Lenormand strings. The Tarot adds a layer of meaning to the whole reading and focuses the answers so much better than, say, simply doing an ordinary Petit Lenormand spread. Honestly, some of the best readings I’ve seen done involved a blending of Tarot and the Petit Lenormand. The secret, however, is applying the Tarot to the Petit Lenormand system, and not the Petit Lenormand to the Tarot. Let’s go ahead and try the techniques described above..! I’m sure you’ll be pleased with the results. Now here’s some information on how to bounce the Petit Lenormand Cards with Tarot Cards. 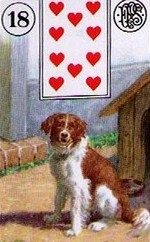 Keeping things easy, let’s bounce one Lenormand card off one Tarot card. The following two cards is what I picked for a consultant of mine. They were meant to answer “who is the consultant” and were part of a larger spread of 5 cards. From the house card, we obviously have a man. I got the vibe of a cozy family man who has mature children. He felt like the nurturing type who tended to all his children, and was perhaps older and wiser, with a lot of fatherly experiences under his belt. The moon card, however, laced the whole affair with fluctuating moods and uncertainty. This was a man who has seen how his past affects his present, and who is aware of how certain decisions he made long ago are still affecting him several years later. It also spoke about someone who’s going through a deep spiritual and psychic transformation. The cards were talking so hard and clear that the man told me that he was indeed going through a period in his life where he was re-evaluating his life choices. He was going through a rough divorce, and the process had changed him… he was busy sorting out the pieces of his life, and was going through a very spiritual cleansing of sorts. As you can see, the Tarot brings in a new depth to the reading. Obviously, you might not want (or need) to use any Tarot cards with the more complex Lenormand spreads… but for smaller spreads (3-5 cards), adding the Tarot is such a charm!! You might find yourself wondering if this is Tarot Lenormand style or Lenormand Tarot style? Whatever it is…give it a try. You just might like it! Thank you so much for your dedication. It makes us readers come to your website everyday. Thank you, Edina! I’m glad you’re enjoying the site. Hi Denice! We hope you find the information useful! Thank you for your comment! A good read Lord Ewin ,I do see your point on why the Life Spread should not work, it may give a small glimpse as opposed to 4 or 5 cards painting a big picture. Don’t get too discouraged. The spread might work really well as a practice to pairings, but ultimately all you’re doing with that spread is telling the cards: tell me about my house life with two cards; tell me about my work with two cards, tell me about my relationships with two cards… The other problem in using the Life Spread with Lenormand is that most Lenormand readers would simply reshuffle for each question to make sure all 36 cards have an equal chance at answering the question..! Thank you for this post! Very inspiring as now i start Lenormand studies. Thanks for letting me know about your experience in combining the two!